Wedding in the Sky? Of course, at Aerophile at Disney Springs. Jonathan and Kaitlyn chose this unique location to have their private elopement 400 fee above the ground. 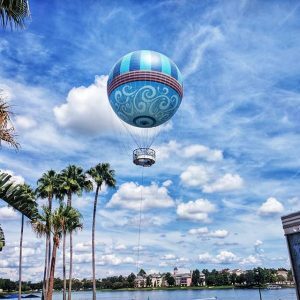 The couple traveled from Delaware to Walt Disney World in Orlando, Florida to tie the knot in this iconic helium balloon. When Kaitlyn contacted Intimate Weddings of Orlando she said she was looking for a unique venue that they would never forget. Jonathan was a little less excited about the venue, (because he was uncomfortale with the heights) but flew to marry the love of his life. Rhodes Studios Photography and Videography captured everything. From the moment the couple arrived at Aerophile through their ceremony in the air, to portraits on the compass dial platform below the balloon and along the shores of Village Lake. Flowers by Lesley crafted a beautiful bouquet and boutonniere of red roses and dark greenery. There was even a hidden Mickey in one of the blooms. Jonathan and Kaitlyn loved the idea of getting married in Florida, but not the idea of waiting in line at the courthouse to get their marriage license. They contacted Married by Mail to assist them in getting their Florida Marriage License, long before they every arrived at Walt Disney World. Rev.Glynn Ferguson with Sensational Ceremonies worked with the couple to craft a beautiful ceremony, just for the two of them. They wanted something intimate, but a ceremony that would feel welcoming to their family as they watched the video when they return home. Re.Glynn gave them a homework assignment, to write and tell him why they love each other. seeing the best in everyone and everything no matter what. She is the hardest working person I know. She dedicates so much time to her classwork, homework, student teaching and to our home that it baffles me how she manages to fit it all in one day. She has a way of making everyday more special then the last and I am truly lucky to have the privilege of spending the rest of my life with her. She truly is my best friend. dog Dad. He is my adventure buddy, my balance, and most importantly, my soulmate. No matter how high the highs, or low the lows, I knew that he was right there beside me, always there by my side. We may argue, but never once have I questioned my love for him since we were 16. He was always my forever. We wish them a lifetime of happiness and may their love soar to the heights!